There is a certain romance associated with India that makes travelling there something of a great adventure, and landing cheap flight tickets to Ahmedabad only adds to that excitement. But why do we pick out Ahmedabad? While cities like Mumbai, New Delhi and Goa are the first choice for many, there are less well known but equally resplendent choices available. Ahmedabadis one such example, and Compare and Fly let you browse and book cheap flights to Ahmedabad in a matter of a few clicks, with no hidden booking costs to trip up your plans. While it's less well known than some locations in India, Ahmedabad is the fifth largest city in this beautiful country, and ranks third in the list of the fastest growing cities in the world. Its importance is headlined further by being the judicial capital of the Gujarat region, so it's undoubtedly a place to visit if you get the opportunity to do so. For the cosmopolitan traveller, Ahmedabad proves a worthy stamp on the passport, as its close-to-6-million inhabitants are comprised of a mix of religions, histories and backgrounds. It has a chequered history dating from early medieval settlements, through the dynastic period and surviving the rule of the British Empire, thus creating the romance that so many travellers seek when they holiday in India. Much of this history is preserved in the museums of the Shreyas Foundation or similar, so it's accessible and available for all to enjoy. For those with a taste for culture, the city boasts many festivals throughout the year, extolling the many facets of its diverse culture. From Uttarayan - an annual kite flying day - to the festival of Deepavali, there's no shortage of attractions.For epicureans, rich and flavourful dishes like Gujarati thalicrown every menu to tease the taste buds, so your holiday cuisine can be every bit as exotic and exciting as the sightseeing. 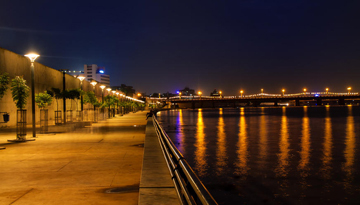 Nestled on the banks of the Sabarmati, Ahmedabad is a rising city offering a warm welcome to its many visitors. Given that fact, it'd be no surprise to want to spend some time there, but with Compare and Fly's easy to navigate comparison service offering you all of the very best offers on cheap flights to Ahmedabad, you can even sort your holiday out at discounted rates too. Don't settle for paying even average prices on your flights. Instead, depend on us to find leading deals. 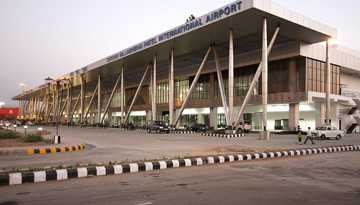 Best Emirates flights to Ahmedabad from Heathrow with return economy class fares at £439*. 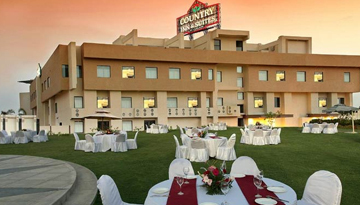 Country Inn and Suites Ahmedabad is a deluxe base & 4 star accommodation in Ahmedabad. Fly from London to Ahmedabad & Stay for 3 Nights with 3 star accommodation. Include Room Only.